Programmatic advertising has grown by hundreds of percentage points, and as the industry has matured, market consolidation has commenced. Many vendors are too small and cannot compete with the industry’s maturing tech and big players’ data. Others are in a M&A frenzy to get better technology, sales efficiency or data to position better themselves in the market. From Jan 2016 to April 2018, advertisers reduced the number of demand-side platforms (DSPs) to 4.2 from 7.1, a 40% decline, according to eMarketer. For some, the trend can seem natural, but there is a big downside for the whole programmatic industry and DSPs: M&As are self-annihilating the programmatic industry. There are thousands of brands competing in online ad auctions, but somehow supply-side platforms (SSPs) get fewer and fewer competing bids as the years go by. This is not because there are fewer buyers that want the inventory – it’s mostly because the number of DSPs has decreased over time. The real value of each impression is not being valued according to the real supply and demand out there. It is heavily affected by the number of DSPs that represent the demand. 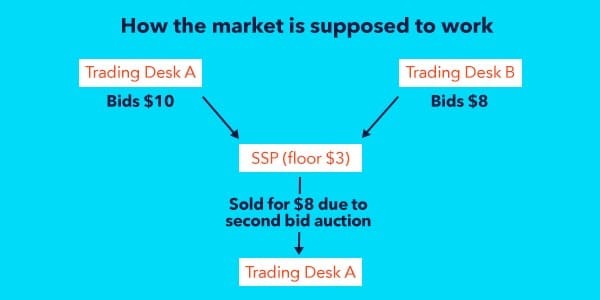 In order to demonstrate this, we need to better understand the Vickrey Auction, also known as second-price auction, where the highest bidder pays the second-highest bid. The impression sold for $3, because the SSP set a floor. If the publisher used a $9 floor, it would have tripled its income. Setting floors on a whim is not a recipe for an efficient market. The waste is huge. SSPs and publishers build teams and technologies trying to predict the best floors to use, attempting to find the sweet spot to simultaneously optimizing fill rates and CPMs. With hundreds of thousands of domains selling billions of impressions to tens of thousands of buyers, one would expect that the market would support itself by engineering an auction that helps determine the true value of each impression, without people manually setting floors and investing in prediction algorithms to find the right floors. In a first-price auction, buyers know that if everyone bids the highest bid on a desirable impression, it might work out well for that one impression, but in the long term all buyers will lose. Buyers will have to try to adjust their bids and behavior to the market and not always bid the most they can. So with first-price auctions, buyers will spend as much effort trying to determine how much they want to bid as sellers trying to identify the optimal price floors. We are not solving the problem – we’re just passing it on to someone else. 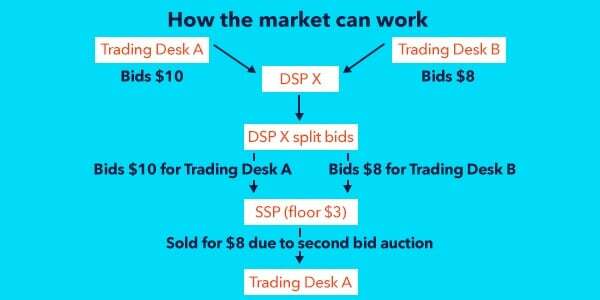 As shown above, if the DSPs created different seat IDs for each trading desk, the market would get a better view of the true demand and supply. 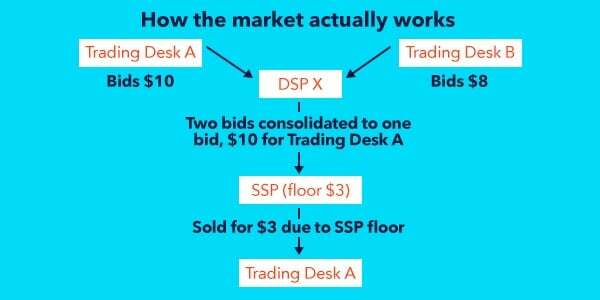 There is no reason why all trading desks should compete under the same bid as they do now. The setup should also be quite simple – no need to change bidding algorithms or integrations. The fact that people are optimizing floors manually and companies are building tech to predict the best floors per geo, device, etc., should be a wakeup call for everyone. The open market is not doing its job; consolidation is here to stay and we need to change the bidding mechanism so the market will function properly. Shifting the problem from the seller to the buyer doesn’t solve anything. We need to work together and find a better solution that will automatically determine a fair value for each impression in a way that represents the true demand and supply, as seen by trading desks, brands and publishers.